Definition at line 45 of file llfloatertos.h. Definition at line 53 of file llfloatertos.h. Definition at line 227 of file llfloatertos.cpp. 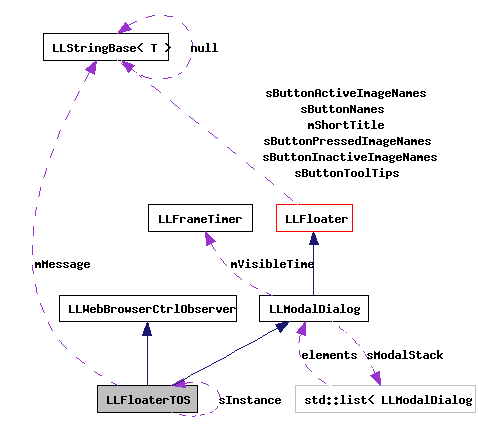 References LLUICtrlFactory::getWebBrowserCtrlByName(), gResponsePtr, NULL, and sInstance. Definition at line 76 of file llfloatertos.cpp. Definition at line 246 of file llfloatertos.cpp. Definition at line 288 of file llfloatertos.cpp. References LLViewerWindow::alertXml(), gViewerWindow, llendl, llinfos, login_alert_done(), LLStartUp::setStartupState(), and STATE_LOGIN_SHOW. Definition at line 261 of file llfloatertos.cpp. References gAcceptCriticalMessage, gAcceptTOS, LLStartUp::getStartupState(), llendl, llinfos, LLStartUp::setStartupState(), STATE_LOGIN_AUTH_INIT, STATE_LOGIN_SHOW, STATE_LOGIN_WAIT, TOS_TOS, and TRUE. Definition at line 299 of file llfloatertos.cpp. 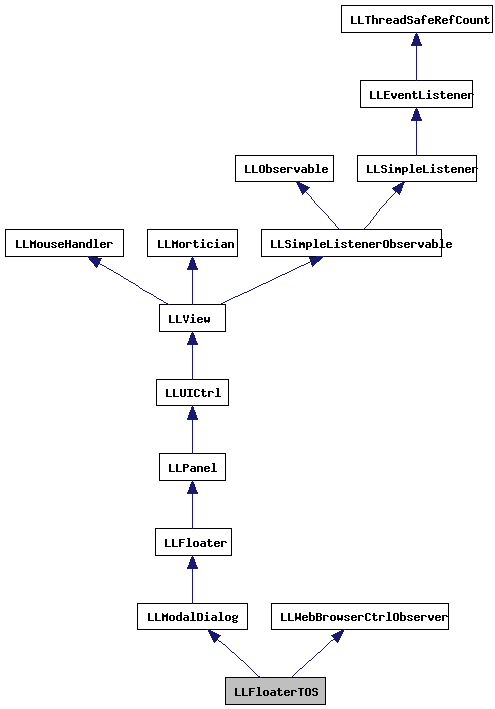 References LLUICtrlFactory::getRadioGroupByName(), llendl, llinfos, mLoadCompleteCount, and LLRadioGroup::setEnabled(). Definition at line 126 of file llfloatertos.cpp. References LLIamHere::build(), LLPanel::childGetValue(), LLPanel::childSetAction(), LLPanel::childSetCommitCallback(), LLPanel::childSetValue(), FALSE, LLHTTPClient::get(), LLUICtrlFactory::getRadioGroupByName(), LLUICtrlFactory::getTextEditorByName(), LLUICtrlFactory::getWebBrowserCtrlByName(), gResponsePtr, mMessage, mType, onCancel(), onContinue(), LLRadioGroup::setEnabled(), LLTextEditor::setEnabled(), LLTextEditor::setFocus(), LLTextEditor::setHandleEditKeysDirectly(), LLTextEditor::setReadOnlyFgColor(), LLView::setVisible(), LLTextEditor::setWordWrap(), TOS_TOS, TRUE, updateAgree(), and LLColor4::white. Definition at line 191 of file llfloatertos.cpp. References LLPanel::childGetValue(), FALSE, LLUICtrlFactory::getRadioGroupByName(), LLUICtrlFactory::getWebBrowserCtrlByName(), mType, LLRadioGroup::setEnabled(), and TOS_TOS. Referenced by LLIamHere::error(), and LLIamHere::result(). Definition at line 56 of file llfloatertos.cpp. References LLUICtrlFactory::buildFloater(), gUICtrlFactory, LLFloaterTOS(), sInstance, and TOS_TOS. Referenced by LLPanelLogin::handleKeyHere(), and idle_startup(). Definition at line 253 of file llfloatertos.cpp. Definition at line 82 of file llfloatertos.h. Definition at line 80 of file llfloatertos.h. Definition at line 79 of file llfloatertos.h. Referenced by postBuild(), and setSiteIsAlive(). Definition at line 81 of file llfloatertos.h. Definition at line 84 of file llfloatertos.h. Referenced by show(), and ~LLFloaterTOS().